Like most kids, Katie loves yogurt. I mean, she really, really loves it. Since the health benefits of yogurt are endless (here’s a great rundown), I am all too happy to indulge her. I don’t, however, buy flavored yogurt multipacks. Because these yogurts are typically packaged in unsafe plastic and are loaded with sugar. 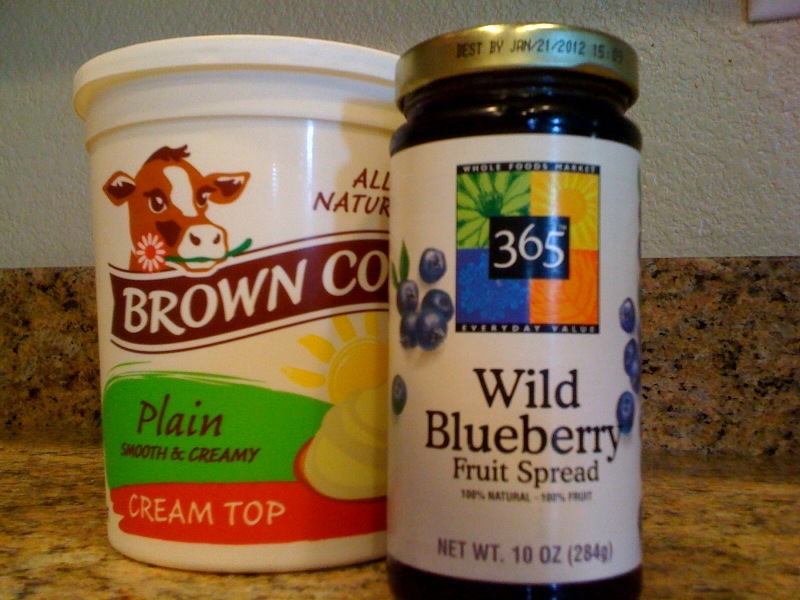 I buy plain organic yogurt and 100% fruit spread and we mix our own, which enables me to control not only the amount of sugar, but also the serving size. Mixing our own also saves us money, since larger containers are more cost effective. Great idea! I use greek yogurt for everything! My two boys don't think they like it but I use it in place of sour cream for all of their favorites! I never thought to mix my own. Is that yogurt "whole fat" (does that make sense)? I don't like to give Parker light stuff that is made with fillers so it tastes good. Right now we do yobaby in the *gasp* plastic containers (kidding on the gasp) but only because I hadn't found a flavored large container that was "full fat" (they all tend to be "light" or "low fat") and I never thought to add fruit spread. I knew I could add my own fruit but right now Parker doesn't eat much whole fruit (even bananas) so I didn't think I had an option. This might "work for me" too! Thanks for sharing. The yogurt that we use is cream-top, full fat (and oh-so-delicious). Maybe you could mash some banana to include? I've also thought about trying this with avocado when I introduce solids to Matthew. I used to do this. Until the girls started school and looked around and saw that they were not getting the same yogurt as the rest of the kids. And then I caved. I'm on the same page as Kris. I did all this when my kids were teeny, except we favored unsweetened, natural applesauce over fruit spread. But by the time they went to school, all my kids raised a ruckus about it and I let them have the regular stuff. What a great idea. I must be thick, because I've never thought to do this, and my oldest kid is 19. So I hustled my little self to the store today and bought some plain yogurt. I accidentally made peach "syrup" instead of jam last week (only mixed in half the sugar), and I'm sure it will be fab in yogurt. I'm giving some of it away on my blog if you want to come over and enter for a chance. Thanks for a little healthy and frugal information! I don't buy the sugary yogurts either. We do something similar to your approach. However, we make our own yogurt. Really simple to do! And the kiddos love it.